Players of the immensely popular videogame – Minecraft has sold over 50 million copies – will soon be able to step inside the world of paintings and installations from the Tate collection, undertake activities and challenges that relate to their themes or explore how they were made. 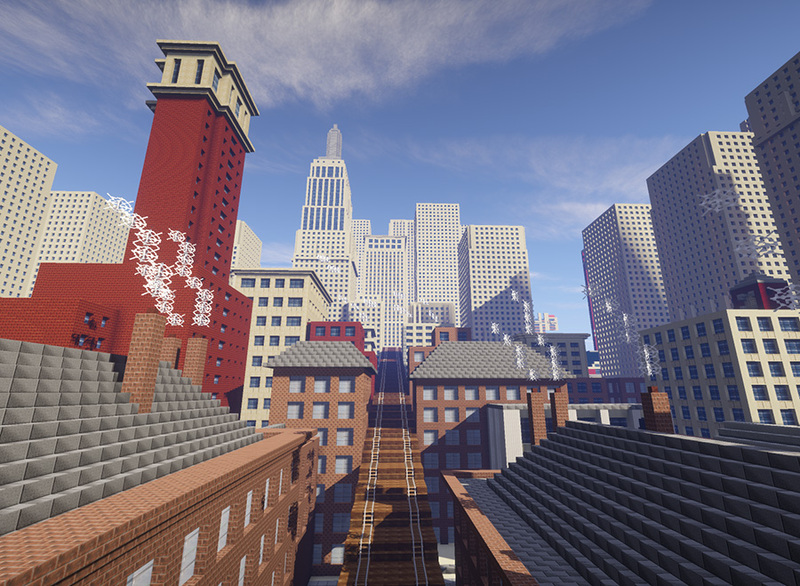 The first Tate Worlds maps will be available to download free for the PC and Mac versions of Minecraft from Monday 24 November 2014. Focusing on the theme of Cities, the first two maps are inspired by André Derain’s 1906 painting The Pool of London and Christopher Nevinson’s 1920 painting of New York, Soul of the Soulless City. In Tate Worlds: The Pool of London players will explore a section of the river Thames where ships unloaded cargo and goods were traded, discovering historical landmarks in a brightly coloured world like the painting itself. In Tate Worlds: Soul of the Soulless City, you will board a train taking you past some of the New York landmarks Nevinson would have seen, before you roller-coast into the future as the skyscrapers go up and up. Six more Tate Worlds maps will be released over the coming year on the themes of Play, Destruction and Fantasy, inspired by well-known artworks including John Singer Sargent’s Carnation, Lily, Lily, Rose 1885–6; Peter Blake’s The Toy Shop 1962; John Martin’s The Destruction of Pompeii and Herculaneum 1822; and Cornelia Parker’s Cold Dark Matter: An Exploded View 1991. Minecraft is a tool for creation that has captivated millions of children and young people across the world. In playfully reimagining art in Tate Worlds for Minecraft we hope to introduce a new generation to inspirational works from Tate’s collection. Minecraft is a open-ended videogame where you can collaborate with other players to build worlds. Tate Worlds will be launched at Insomnia53 Gaming Festival, Rioch Arena in Coventry, and the first two maps available for free download on Monday 24 November. Tate Worlds is a collaboration with Adam Clarke, Lead Artist and Producer, The Common People; Map maker Dragnoz and Minecraft builders Kupo, Featherblade and Tewkesape; Jane Burton, Creative Director, and Tony Guillan, Producer, Tate. Blog: Happy National Poetry Day from Tate!